CROXON CYPRON are suspended cylindrical sound absorbers, constructed of polyester fiber, covered with acoustic fabric with excellent absorption qualities for optimal reduction of the reverberations. They are particularly useful in situations where the space under the roof has other services which prevent installation of conventional baffles. Not only excellent results are achieved with this product, but aesthetically it possible to create innovative decorative solutions. CROXON BAFLÓN is an absorbent baffle for type roof beam based polyester ool, designed to control reverberation and provide an attractive linear view. This design allows air to pass between the panels and allow the transfer of air or smoke extraction. The core of polyester fleece is reinforced by an extruded profile of the same material and coated with a polyester fabric. These absorbent beams can be attached to the ceiling by cables or other metallic elements. CROXON CORLO panels are the first innovation in the range of floating roofs Croxon. 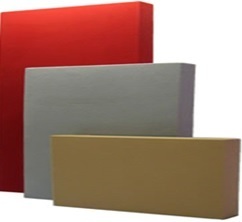 They are made entirely from both the perimeter and internal structure as the absorbent core polyester fiber. Specially designed to create spaces or highlight specific areas of large volumes, adding a decorative and acoustic comfort, located in an area or in a workspace. Surface are micro perforated. CROXON BAFLA is an acoustic baffle made by a core polyester wool, coated both sides with an acoustipermeable fabric. These baffles hanging absorb and reduce reflections of sound acoustically tolerable levels to. Are providewith dimples for hanging ceiling by cables. 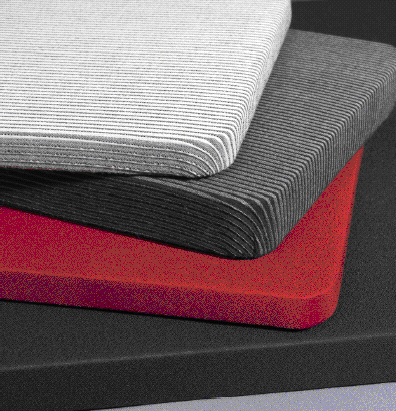 CROXON iCOD is an absorbent panel based on core polyester wool coated with a decorative acoustic fabric, designed to control reverberation times in walls and ceilings. It is manufactured in a wide range of thickness and formats.